Nexi is kind of old news but she’s getting some new friends in the form of a Mark III robot that is being built at MIT’s Media Lab. Nexi here follows your eyes and can sense who you are via RFID. She is very scary. 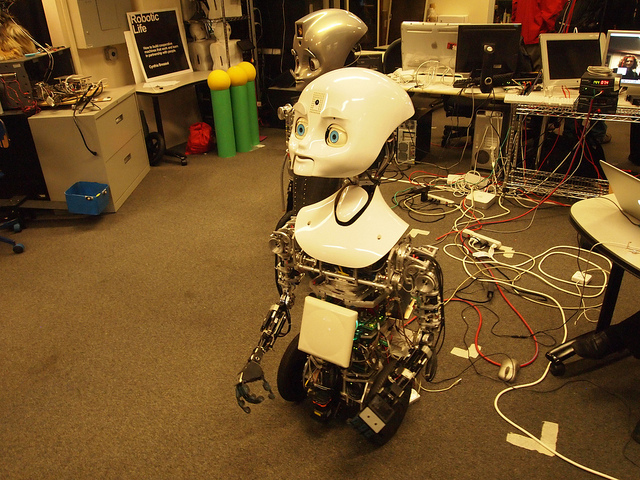 To address the comment below, Nexi and her brothers were designed to do two things: to create a comfort zone with people who may not trust or want to deal with robots and to allow robots to follow non-verbal cues. By paying attention to eye motion and gestures, robots like Nexi really “interact” and what I was trying to show is how uncanny she is as she looks at you and follows your eyes around. Obviously she has huge freaking eyes, but the motion is smooth and quite weird.